Shows the listing of all available redline projects. If there have been no projects created, this list will be empty. Select a redline project in the "Available Redlines" projects listing and click the "Open" button and it will be opened and appear in the "Open Redlines" project listing. Redline projects are not visible on the map until they are opened. Select a redline project in the "Available Redlines" projects listing and click the "Delete" button and it will be deleted permanently. Click the "Refresh" button and the listing of redline projects in the "Available Redlines" projects listing will be refreshed from disk. Shows the listing of all open redline projects. Open redline projects will be visible on the map. Select a redline project in the "Open Redlines" projects listing and click on the "Close" button to close the redline project. All redline features of that project will be removed from the map and the redline project will appear in the "Available Redlines" project listing. 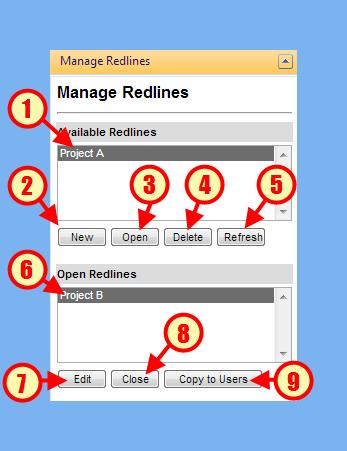 Select a redline project in the "Open Redlines" projects listing and click on the "Copy to Users" button to send a copy of the redline project to another user of the site. 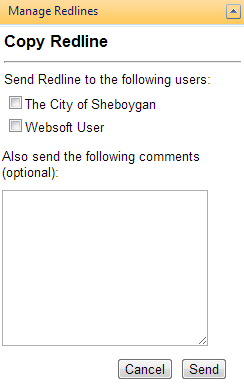 Additionally, you can enter comments and the user will be notified via email of the redline project.